Want a healthy, stylish, honest and tasty breakfast or lunch? Try out Tinsel! 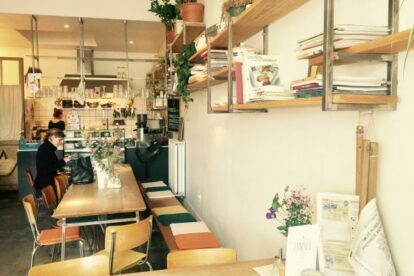 If it wasn’t for their original drinks, great sandwiches and other lovely lunch-ideas, the owner of Tinsel should have been an interior architect. All furniture here seems custom made, well thought through and at the same time you feel like you could be making it at home yourself. Everything that is true for their interior, goes for their menu as well. Everything is homemade, the flavours are unique and at the same time you will be inspired to make the same at home one day. Since the first time I visited Tinsel, I have been making my own lemonade at home for example. In an ideal world, Tinsel would have been a little bigger. Finding a seat is hard and making a reservation is not accepted. If you do find yourself lucky enough to find a free spot, you are ordering your food and drinks at the counter using a pencil and their paper template. After ordering, there is service at the table. My personal favorite is the homemade cassis and mint lemonade and one of their salads which is always loaded with vegetables (so not only greens). If you fancy a brunch, try out their breakfast pancakes. Still hungry? Their sweets are also homemade.